“Is it in a packet that says Wild Apple sweater and cardigan?” came the voice from the loft. The Wild Apple has been found! But not before I managed to make some other purchases. . .
Old Maiden Aunt Corriedale sportweight corriedale in shade “pumpkin pie.” I’ve knitted with Lilith’s corriedale several times and it remains a firm favourite. I seem to be in a curious orange phase at the moment and this is a particularly delicious shade. Wonderful Siaban from Uist Wool. I love the marled quality of this pale grey, which comes from the varied tones and shades of the darker fleeces that have been blended with the yarn’s cheviot base. I’ve been looking forward to working with the yarn spun in Uist under a fantastic local enterprise for quite some time now. Even just in the skein this lovely springy sproingy woolly wool does not disappoint! 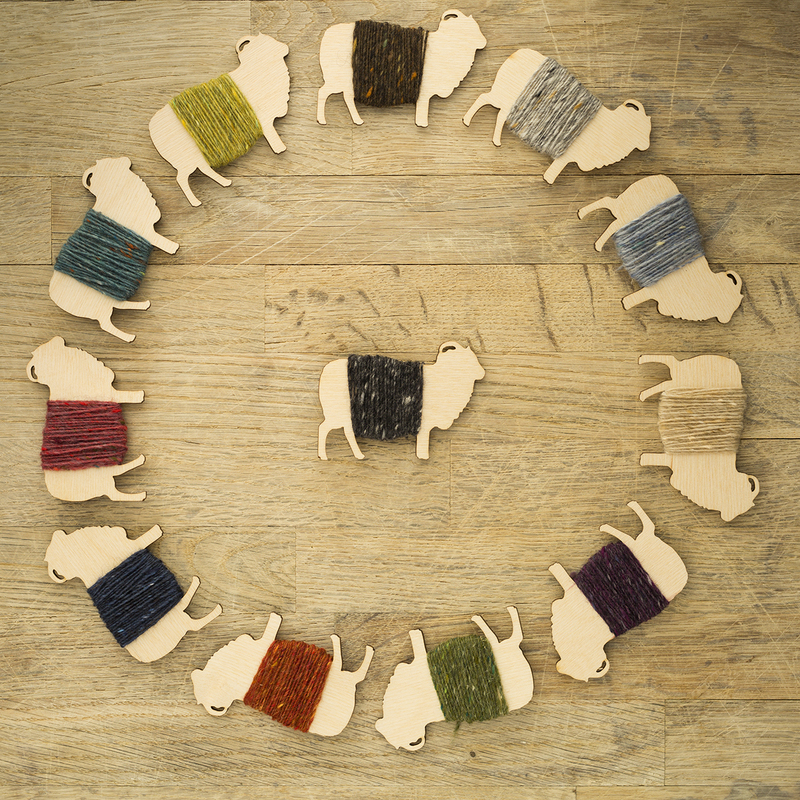 Uist Wool will be at Edinburgh Yarn Fest next month – I think I might need to find time to pop by their stand. Another new-to-me yarn from the Birlinn Yarn Company , a venture run by Meg Rodger from her Berneray croft. Overdyeing yarn spun from a blend of hebridean and cheviot fleeces results in some really beautiful dulled shades. The colour I chose is called sgeir or reef, and I’m looking forward to seeing how it knits up. Because of all your suggestions, I now have definite plans for all three of my new yarns (as well as the elusive Wild Apple) and as I’m feeling rather under the weather at the moment some serious knitting time is definitely in order! 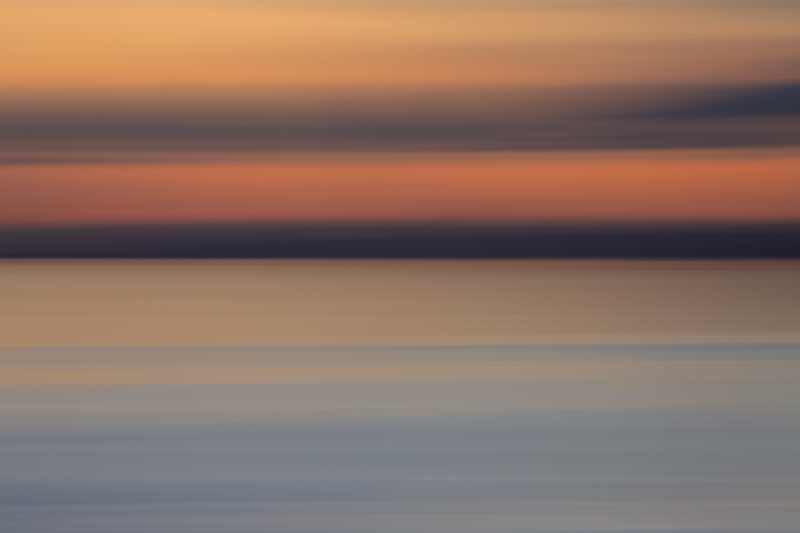 So thanks so much to all of you who left a comment – I found lots of inspiration there. Late to the celebration party here – but – YIPPEE!!! You found Wild Apple! Gnawing feeling of “I know it is around here somewhere…am I going crazy?” is BANISHED! Gotta say you made some gorgeous purchases. Mad for that pumpkin color. I have something close to it in a heavier weight yarn that might work for your Owl pullover…b-u-u-u-t, don’t think I could knit orange owls. Owls are flying around in my thoughts but none have landed yet ;) Think Finlaggan and Oa will out pace Owl :0! So pleased your Apple has been located. Your new yarns are beautiful and will make inspired finished objects. Best wishes for feeling better soon and that you enjoy your knitting projects while getting to better. Such a beautiful stash. I’ve been attempting to use up some of mine too. Why is it so easy to buy yarns? Wish me luck because my quilting stash is bigger and my priority right now. Only knit or crochet once a week. Oh my! So many beautiful yarns to knit with. I can’t wait to see Wild Apple knitted up. I hope you feel better soon. I love seeing what other people have in their stashes… those Wild Apple colours give me all sorts of ideas – glad you found them for my sake as well as yours! Oh my!! So many beautiful yarns to choose from. I can’t wait to see the Wild Apple. I hope you feel better soon. Enjoy your enforced knitting time. Hope you feel better soon. Loving the Wild AppleYarn shades!! I’m so glad that your kit turned up. I’ve got a Wild Apple kit that I purchased a few years ago sitting in my stash too. I’m working up the the courage & confidence to tackle it, but I’m getting there slowly! I knit a Wild Apples sweater a year or so ago! It was absolutely lovely to knit and I wear it all the time! I am working through some other planned knits and dreaming about which Bohus sweater I will do next now. sounds like you are a real knitter now you have a stash Kate. Glad you found your kit :) It reminded me that I have a couple of small kits of yours sitting in my cupboard. Time to get them out and enjoy. Those yarns are very lovely, but so is your Buachaille and I wanted to ask if it would be suitable for the designs in your other books. I agree with Christine. I would keep the colours out just to look at them. Such inspiration. Glad you found the Wild Apple even when you’re positive you didn’t put it someplace that’s usually where it shows up. When you were asking for project ideas the suggestions people gave reminded me of some old favorites. I hadn’t ordered from Sunday Knits in ages and found numerous patterns I want to make. Thanks everyone for your suggestions of different designers I had forgotten about. It’s a great feeling when you find something that was lost. I remember once, finding a large bag of 70’s Laura Ashley fabric scraps in the loft of my parents home. You’d have thought I’d won the jackpot! Guess where they are now? In our loft! And they’ve been there for some years now! I hope you find a project that makes you feel as well as your blogs and Tom’s photos, make me feel. ha, sounds like my house….surely not there !! all the colours are beautiful and you will have fun employing your mental faculties to dream up great stuff!! Mmmm yum. I knitted a Hap for Harriet in pumpkin pie Shetland last year and I have to resist the urge to just wear it ALL the time with everything. I’m delighted that the apple was found. Sometimes one doesn’t distinguish the right apple tree in the orchard! I feel a Bohus in my future but my queue’s a bit long for now. Enjoy and thanks for causing all the wonderful links! Feel better. A good helping of that apple will surely keep the Doctor away. You’ll have a glorious time with Wild Apple! I made the Wild Apple cap a few years ago and it’s still a favorite! Wonderful! It had to be somewhere, isn’t that the truth of it! They do turn up. Gorgeous colours. Wonderful news! I was feeling very sad for the elusive Wild Apple. I knitted it many years ago now and the colors are so gorgeous! The yarn has quite a halo (aka fuzz) that keeps me occupied picking bits off, but it’s lovely and so soft. Now if you could kindly send Tom to my house – there are a number of things I can’t seem to find. So glad you found ot, and got some new treasures, too! I knit a “Wild Apple” hat a few years back which I was afraid I had lost. It was found, but not before I started looking forward to knitting it again. I remember the intoxication of color and texture. Beautiful colours kate. Oddly I too am in an orange mood at present. My daughter calls it ‘burnt orange like my soul’ which I totally get. Hope you post pics of the wonderous things you make with your treasure. Off to Inravel tomorrow to treasure up myself! Get better soon. I myself have been immobile for three weeks now with a faulty back. Where would we be without knitting (and audiobooks!). Beautiful colours in all the yarns, warm and inviting for your upcoming knitting projects. Such beautiful colors!! Is someone still selling kits/yarn for Bonus sweaters? Go to: angoragarnet.com then set the site to English (unless, of course, you read Swedish! ), then go to the Bohus Stickning drop down and search from there. You need to send them a message if you want to order a kit. I haven’t done so yet, perhaps others have? Note that, at least for the Wild Apple pattern, there are two different authorized patterns—in two different gauges. So if you have the Poems of Color book, the gauge is for sport weight yarn; the angora garnet pattern is for lace weight. I had forgotten it was so fine. I must have blocked it out of my mind. That’s why my kit is currently, unknit. Yes I did Lauren and they were so helpful. They are working on limited supplies now to be kind to the rabbits but also….the price is now very expensive again because of being kind to the rabbits, keeping them vaccinated etc. I ermm…did get a hat kit though! Waiting eagerly for it to arrive! Gorgeous wools. I have now knitted all of my main body parts of a Shetland cardie for my sister and am about to embark on the circular yoke. I haven’t done one for years but I’m very excited about it as the colours are all the shades of the mountains; heather, brambles, moss and bracken. 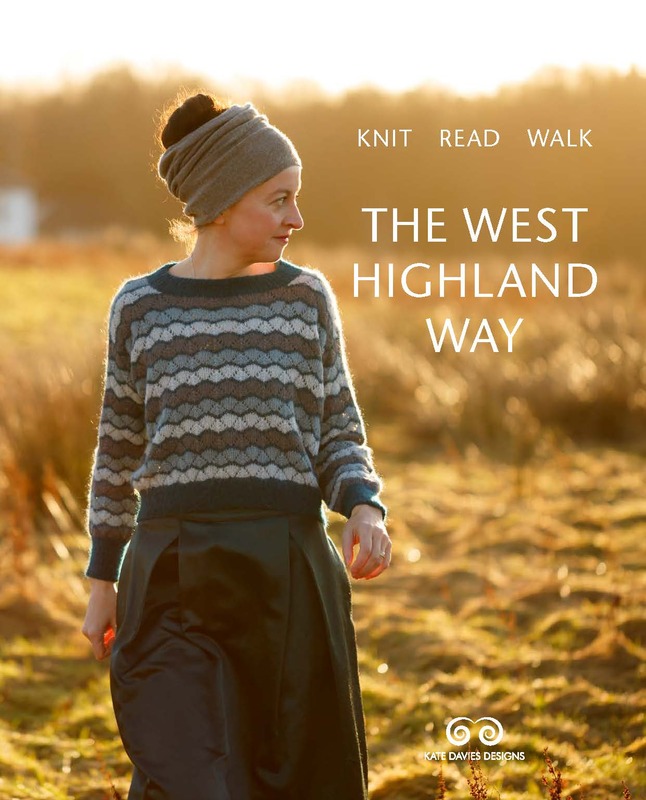 Have plans for all of these wools too and also for buachaille. My daughter has ordered a hap from your book. Discovering you has brightened my knitting. Hope you feel better soon. Take care. Glorious colours in the Wild Apple, they should help make you feel a bit better just by looking at them. I hope you’re feeling better soon.